The play "Imoseyama Onna Teikin" was originally written for the puppet theater (Bunraku) and staged for the first time in the 1st lunar month of 1771 in Ôsaka at Takeda Shinmatsu's theater (ex-Takemotoza). It was quickly adapted for Kabuki and staged in Kyôto in the 3rd lunar month of 1771 at the Kitagawa no Shibai [casting]. It was a long run, produced from the 25th of March to the 10th of the 5th lunar month of 1771. 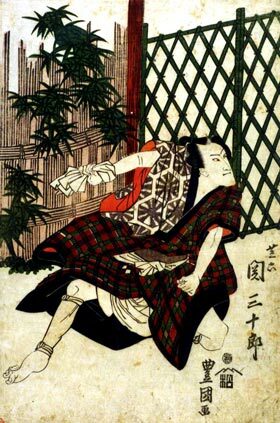 For this premiere, the roles of Shibaroku, Kamatari, Tankai and Okiji were played by Edosaka Kyôemon, Onoe Shinshichi I, Fujimatsu Sanjûrô I and Sawamura Kunitarô I. The "Shibaroku Sumika" scene went into oblivion at the beginning of the 20th century. It was fortunatelly revived at the National Theatre in April 1974, starring Nakamura Ganjirô II, Onoe Kikujirô IV, Sawamura Tanosuke VI, Nakamura Shikan VII, Nakamura Tôzô VI, Ôtani Tomoemon VIII, Nakamura Kôji and Nakamura Kotarô V in the roles of Shibaroku, Kamatari, Tankai, Okiji, the emperor, Uneme, Sugimatsu and Sansaku. "Shibaroku Sumika" is the last scene of the second act of "Imoseyama Onna Teikin". Taking advantage of the fact that the Emperor Tenchi is blind, Tankai takes him to Shibaroku's house and makes him believe that he is living in his palace. Due to the expenses necessitated by the stay of the Emperor Tenchi and his entourage, Shibaroku finds it difficult to make both ends meet. When Shin'emon, a rice dealer, comes to collect bills has wife Okiji falsely says that her husband is absent. Taking advantage of his supposed absence, the rice dealer tries to make amorous advances to her when Shibaroku suddenly appears and declares that the rice dealer, by reason of his attempted seduction of his wife, is liable to a fine, which larger than the sum Shibaroku owes him. Shibaroku thus succeeds in expelling the bill collector. 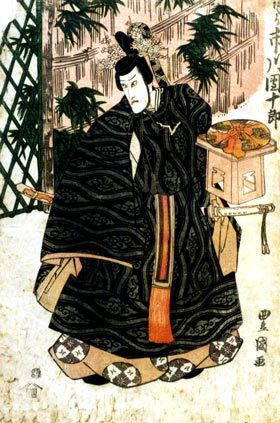 The blind Emperor Tenchi, who believes that he is in the palace, orders Tankai to make the court musicians perform. As it is out of the question to present anything like a regular performance, Shibaroku recites a comical ballad to entertain the Emperor Tenchi. After the Emperor Tenchi's retirement for the night a messenger from the village headman's office visits the house to report that the Kôfukuji Temple, which, supervises the deer in Nara, is looking for the man who has killed a deer. Sansaku asks his younger brother Sugimatsu to go to the Kôfukuji Temple to deliver his letter. Unknown to Sugimatsu, the letter says in the name of Sugimatsu that Sansaku has killed the deer. Soon after Sugimatsu's departure Iruka's agents come to the house to look for the Emperor Tenchi and Tankai. Taking Sansaku as hostage, they threaten to kill Shibaroku if he does not admit keeping the Emperor Tenchi and Tankai in his house. Shibaroku promises to tell them the truth at the village headman's office. After Shibaroku has left with the agents, Tankai appears with the Emperor Tenchi and says that they must escape from the house, but Okiji assures them that her husband will never tell the truth. An official in charge of deer protection comes from the Kôfukuji Temple with Sugimatsu as his guide to arrest Sansaku. Sansaku admits having killed the deer and is taken to the Kôfukuji Temple where he is to be buried alive as a punishment for his crime. Shibaroku comes back and tells his wife that he did not tell the truth at the village headman's office. He then kills his son Sugimatsu to show his unparalleled loyalty to the Emperor Tenchi, never telling the truth even if he has to sacrifice his own son. Kamatari comes to the house with Uneme, who in fact has not drowned herself, and Sansaku, whose life he has saved by digging the ground where he buried. He shows two Imperial treasures, a seal and a mirror, which he has dug out of the earth near where Sansaku was buried. He says that Emiji stole them from the Imperial Palace and buried. When the Emperor Tenchi faces the mirror shown by Kamatari he recovers his eyesight. The Emperor Tenchi is happily reunited with Uneme.